An international, extremely competitive market dictates stronger business rules. Specialized organizations strive for more strict production and trade regulation. Until fairly recently, truffles —like many other fungi— could only be hunted and gathered, not cultivated. There were several attempts on truffle agriculture along history, but it wasn’t until the relationship between a truffle fungi and their host plant (a symbiosis called Mycorrhiza) was fully understood, that some degree of success was obtained. Science has allowed for significant progress in the field of truffle germination and growth. Although the crucial factors involved in the process, are still largely dependent on nature and its changing conditions « The truffle remains in essence a wild crop, random, following its own agenda » (from the book « Truffles » by Elizabeth Luard). In ideal conditions, one can expect a new plantation to yield its first crop in about 5 years however; most young truffières do not start producing black truffles before 7 to 10 years, if they ever produce at all. The first stage for Black truffle growing is conception (when the fruiting body develops), this happens in October and November; a critical growth period follows in December and January. Warmth and rainfall are critical for truffle growth; they also affect significantly the quality of a crop on a given year. A basic parameter commonly used to measure their impact, is based on a comparison between vineyards and truffières production: indeed, a good wine year is a bad truffle year and vice versa. Once the harvest is done, the cropping site must be restored —as close as possible— to its previous state. This is extremely important: since truffles tend to grow in the same place year after year, they won’t develop if the soil has been damaged (roots exposed or broken, etc.). The quality and characteristics of the soil, determine which species of truffle it is suitable for. For all species, the soil needs to have enough porosity to allow oxygen to reach the fruiting body. Rocky soil, rich in minerals, almost never produces truffles. It is also common for truffles to « share » their habitat with other fungi, naturally attracted by the same conditions (the reason why it is not rare to find other varieties, such as chanterelles, pieds de mouton, etc. along with Périgord black truffles for sale in the same market stand). 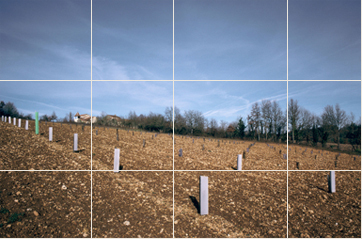 The typical terrain for Périgord black truffles is well aerated, with natural free draining. The amount of certain minerals —such as sands, silts or clays— is never excessive on black truffle soil, whereas other truffle species such as the Burgundy or the Bianchetto, are found on considerably sandy soils. Organic components and nutrients are also very important (up to 8% of organic matter is usually found on black truffle terrain). In France, geographic areas containing iron-rich, red limestone are reputed for producing the best black truffles. Other components commonly present are magnesium, calcium, moderate levels of phosphorus and little sodium. Truffle fungi germinate in the roots of several tree species, developing a symbiotic relationship with them. The most common kind is oak; hazel, lime and poplar are secondary sources (although they are becoming more popular among producers). Oak generally allows for a faster growth. 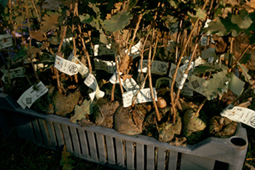 The capacity of a tree to produce truffles is variable. As a general guideline, a tree producing 1 to 3 kg (2-7 lb) per year would be placed on a « high productivity » rank; and a tree producing 200g to 500 g (1/2 to 1 lb) per year, would be ranked as « medium productivity ». A production volume below that would be considered as « low productivity », this kind of tree will likely be removed from the truffière and replaced with another one. Soil can be tested in order to guarantee its quality; an expensive process. However, the key decision-making factor when establishing a truffière is knowing whether or not that specific kind of truffle can be found naturally in the area. Climate must be within the species natural range. When choosing the location, the appearance of the land, canopy and soil quality (ideal soil characteristics are mentioned above) should be carefully studied. It is also important to watch for other fungi growing in the same area, certain species —particularly Ectomycorrhiza fungi— compete for space on truffle host plants, interfering with (and even blocking) their full development. The only fertilizer usually applied prior to planting, is a short amount of magnesium. Some animals such as rabbits, stock, pigs, etc. can be a major problem for truffières —especially for young ones—, it is often necessary to fence the area to keep them out. A truffière must also be protected from the wind that can desiccate truffle trees. There are several methods (both natural and artificial) to avoid this damage. Another major predator is the poacher. Illegal truffle hunting should be monitored and prevented as unmarked or unprotected truffières are often the target of poachers. For this reason, very few land owners in Perigord will admit that they grow truffles. There is a specific way to plant the trees; did you find anything about this in the books? Truffle agriculture is still at an early stage. A more focused scientific approach is helping to overcome many of the difficulties long associated to it; laboratory research and experimental work are making traditional methods for truffle growing evolve. An international, extremely competitive market dictates stronger business rules. Specialized organizations strive for more strict production and trade regulation. These challenges, their complexity and the many mysteries still unresolved in the truffle world, make this delicacy all the more desirable and intriguing. Truffes.com invites you to meet the truffle and experience it first-hand today, through our top of the line truffle product selection.